I saw the wave jet boards on tv the other day. Im not sure if im keen about having these jetting around the line up anytime soon. Has anyone used one or seen one in action? Any good? My understanding is that those jet boards being motorized should not be any closer than a Jet ski to surfers.Hope so. Thing is they're expensive. How many surfers do you know with $6,000 to blow on a wave jet? There is a fella up on the sunny coast flogging "powerboards". He was mostly targeting clubbies on their hollowed out tree sized paddle boards. Looked to be way more hassle compared to benefit. Yeah that guy is a real 'tweaker'but having a go so can't knock him for that. Dave Biggar up at Cure composites at Coolum is helping him out after big bucks spent on having them knocked up in China. If I see one in the line up its on...They have a battery and prop. Heaven forbid.. I think you find they have an archimedean screw jet rather than a propellor a sort of impeller thingo. Like the Huka jets in NZed and the jet skis they don't have the reverse thrust of the jet skis but would be welcome to a thrust right out of any surf zone hopefully maritime services will require them to be registered and have a no go zone in the surf near other people. Won't stop tools and fools. Oh what fun. I can see a thead on these things like the leggy debate. Look out! 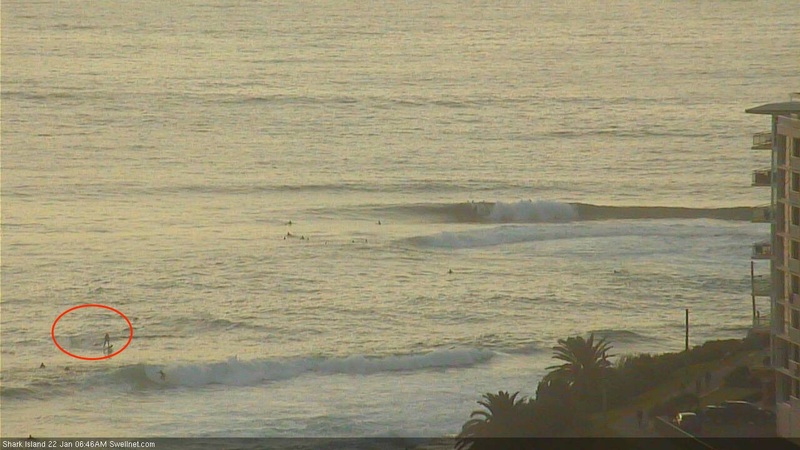 I got my SUP to drop in and snake mal riders not surfers! Also, on topic I believe the main drive behind "power boards" was for people with injuries or disabilities,which affected there ability to paddle, to get out there and enjoy our ocean. Good luck to him. 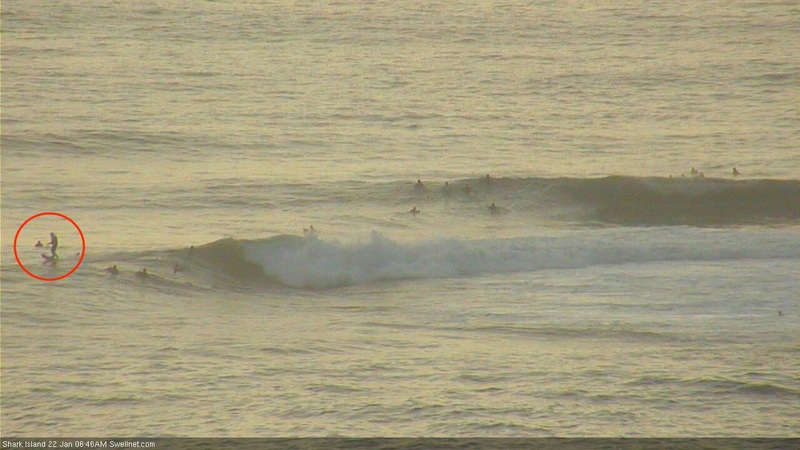 If the surf is any good I doubt you would see any of these out there anyway. Wow, that was bizarre. 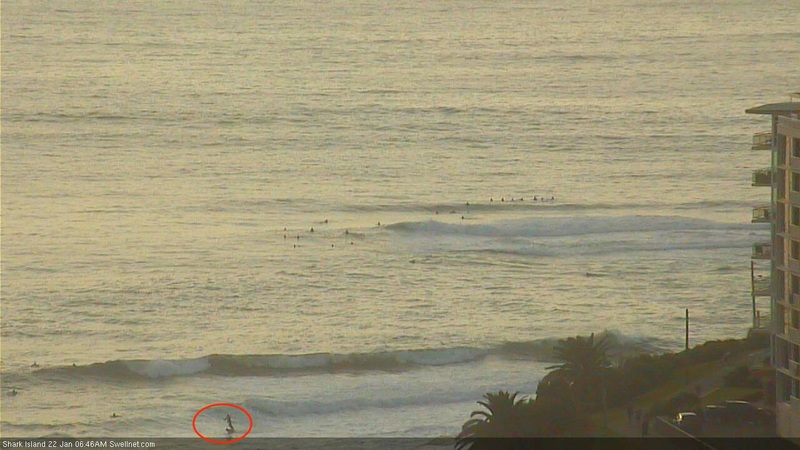 Just watching the Shark Island surfcam, and noticed a bloke out the back of the lineup doing circle work. Looked like a tow-in surfer, but I couldn't see a ski. Watched closely and he pulled into a small set - wasn't sure if the camera's zoom was framing out the ski, but suddenly he pulls into the channel, and..... keeps on going! So I started taking a few snaps off the cam. As the camera zooms out to the wide shot (fortunate timing), it shows this bloke motoring into The Patch, where he proceeds to work his way through another small wave. Dawned on me that this bloke was probably riding a WaveJet. This is the first time I've seen or heard of someone actually sharing a crowded lineup (Shark Island, no less!) with a motorised device like this. I saw a guy riding a wave jet a few years ago at the point. It was a fairly big day and while he rode a lot of full waves off the shoulder and into Cronulla beach, he occasionally came across around the back of the lineup and picked up a wave on the inside and rode it most of the way to the beach. When he was taking off on the inside, he used the power to get on the wave and then he generally rode without power but occasionally he accelerated hard to make a section. Once he was on the shoulder he'd hit the power again and kept going, performing manoeuvres on full swells that regular boards couldn't ride. The usual point riders probably know who he is. 1965 Boeing dude kicked them off...US+ Oz surf museums got their own models. Full-face Helmets Gloves/Boots the whole racing get up for Euro/U.S. Jet Board gangs. Many Cruise Ports have the Jet Board packages...Mostly Bikini Girl Promos. (Jetsurf -2008 Czec F1) 2012 model/ Demo at Sanctuary Cove Boat Show Gold Coast. (U.S. Carver Hire Models- Sell $9,000) Speed 30km/hr + Turning circle 30m prone/10m stand.